· Let's look at a few diagrams so that we can understand the borders between the black and white groups. First, Dia. 33: can you understand the borders between the groups? 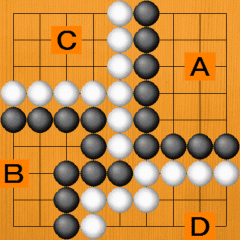 A and B are black territories and C and D are white territories. Let's compare the sizes of the territories. 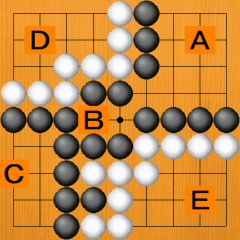 Black A is 15 points and B is nine points. 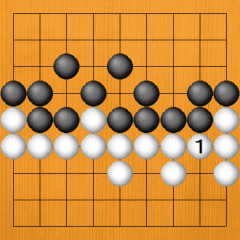 15+9 = 24, so Black's total territory is 24 points. White C is 12 and D is eight, giving White 20 points of territory. 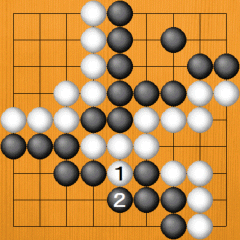 24-20 = 4, so Black has four points more than White. · The shapes in Dia. 34 are a little more complicated. Black has three territories. A is 13 points, B 2 and C 8, making a total of 23 points. White has two territories. D is 10 and E is 11, giving him a total of 21 points. 23-21 = 2, so Black wins by two points. · (Actual game example 1) Let's check the final territories in an actual game. In Dia. 35, it's Black's turn to play. A and B are already secure territories for Black. C and D are white territories. Is there any point that is not yet decided? · Dia. 36. Black 1 is a one-point move. This stops White from turning the X point into his territory. It doesn't become territory for Black, either, so it's a point of no value to either side. The point marked 'a' is also valueless, as neither side can make a point by playing there. · Dia. 37. Well, what if it's White's turn to play? If White plays at 1, the X point becomes a one-point territory for him. Black 1 in Dia. 36 stopped White from gaining this extra point, so this is important. · (Actual game example 2) The game in Dia. 38 is not yet finished. Please think about it if it is Black's turn to play. If Black plays at 1, White has to defend at 2. As you can see, this has reduced White's territory by one point. There is nowhere else to play, so the game is now over. · Dia. 39. Well, please think about the position from White's point of view. 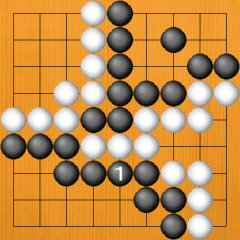 By playing at 1, White can increase his territory by one point. Let's settle the borders between the sides and end the game. · (Actual game example 3) How about Dia. 40? 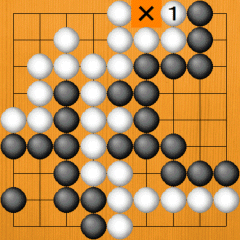 Black 1 increases Black's territory by one point. There are no other points to play, so the game is over. · Dia. 41. What if it is White's turn to play? If he plays at 1, he forces Black to add a stone at 2, so he can reduce Black's territory by one point. Compared to Dia. 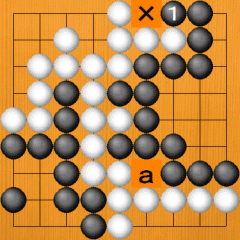 40, Black's territory is one point smaller. This kind of move comes up just before the end of the game. If it is your turn to play, make sure you don't miss them.